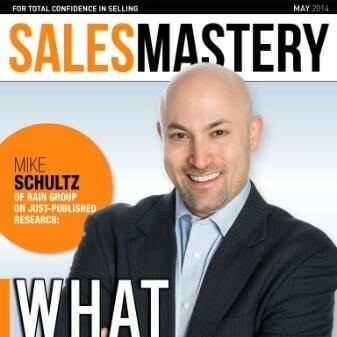 Mike Schultz is a world-renowned speaker, researcher, and sales expert. He is author of several books, including two Wall Street Journal best-sellers: Rainmaking Conversations (Wiley, 2011) and Insight Selling (Wiley, 2014). He was named the Top Sales Thought Leader globally in 2011 by Top Sales Awards. As president of RAIN Group, Mike has grown the company into a global leader, named multiple times as one of the Top 20 Sales Training firms worldwide by Selling Power Magazine. Mike and the team at RAIN Group have worked with organizations such as Toyota, Bright Horizons, BNY Mellon, BDO, Hitachi, Lee Hecht Harrison, Lowe’s, Agilysys, and hundreds of others to unleash sales performance.